• US pet owners will spend more than $24 BILLION this year on pet medical care, an amount greater than the gross domestic product of more that half the world’s countries. • That it can cost $4,000 to $6,000 to train a new animal hospital or kennel employee? • Canine Parvovirus is the most common and serious disease among dogs. • Feline Leukemia Virus is one of the most dangerous infectious diseases in cats today. • Bleach is not an alternative cleaner! • Your pet is at little risk of being infected by Swine Flu (H1N1). • ProVet Logic products can be used at veterinary offices and universities, zoos, boarding kennels, animal grooming and breeding establishments, pet shops, pet resorts, aviaries, animal shelters, poultry, swine and equine houses, etc. • Disinfectant – A 10 minute surface contact time is needed to properly be effective against viruses. 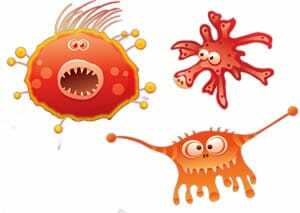 A virus can survive an intial attempt at removal, so a system that uses patience and proper application procedure will be more effective. • You always need to remove your animals from area you intend to clean. • Education and proper training are the “key” to disease prevention in the animal world. • Nosocomial infections are infections which are a result of treatment in a hospital or a health care service unit, but secondary to the patient’s original condition. Pets are no different than humans in this aspect. When boarded or in the animal hospital, they can contact infections or conditions that they did not have before entering.